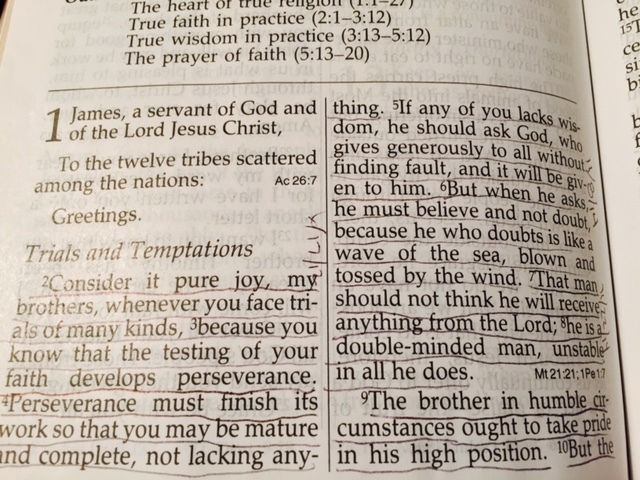 ”Consider it pure joy, my brothers and sisters, when you face trials of many kinds because you know that the testing of your faith develops perseverance. Perseverance must finish its work so that you may be mature and complete, not lacking anything. “If any of you lacks wisdom, he should ask God who gives generously to all without fault and it will be given to him. But when he asks, he must believe and not doubt, because he who doubts is like a wave of the sea, blown and tossed by the wind. That man should not believe that he will receive anything from the Lord, he is a double-minded man, unstable in all he does. He should take pride because he has persevered in his faith despite his lack of earthly possessions. This man has let his trials grow him and help him be mature and complete. He has asked for wisdom when he needed it. He believed that he received it. There were no doubts. His faith helped him become a stable man focused on God. Please help us follow his example, dear Father. I love this Bible verse. I recently went through a hard time this past year when my son was in the NICU for 2.5 months and is still struggling. This was my main verse and source of strength. I have never grown in my faith so much than going through a hard time. Perseverance definitely builds character. I enjoyed reading this! Thanks for the encouragement. Sorry to hear you are going through a rough time but its awesome to hear of God’s faithfulness in your life. We are memorizing James 1 so that it’s etched upon our minds – you’re welcome to join us. The phrase ‘Consider it pure joy’ echoes through my mind whenever I am faced with conflicts or difficulties. God has a very calming effect on us if we instantly call on his name. May he continue to bless you through this experience!